Contraband abounds in terms of such material as weapons and drugs. As a Virginia criminal lawyer, I berate myself that after the bar exam and two years before becoming a criminal defense lawyer I made the error of bringing a friend’s locked suitcase to Singapore as part of my four-week post-bar exam vacation in Southeast Asia without first checking the suitcase myself for contraband; fortunately, none was therein, as I had expected. Next, I against risked (and avoided) arrest and prosecution for contraband possession when staying in place rather than leaving when my tourguide and five of eight fellow trekkers in Thailand’s Golden Triangle smoked opium only feet away from me in the large hut we all shared overnight in a Hmong village. Time and time again, clients of mine charged with contraband possession tell me that another vehicle passenger tossed illegal drugs or a weapon in the direction of my car occupant (or driver) client, or simply left the contraband in the vehicle driven by my client. Clients also tell me of borrowing jackets and other clothing from friends, in which police find illegal drugs/ controlled substances. In other instances, contraband gets into luggage packed by a friend or with my client simply forgetting that it was there in the first place. I do not want my client having to go through an arrest and prosecution for such contraband situations, nor through having to waive their right to remain silent to explain themselves from the witness stand. We simply need to be careful whom we associate with, whom we give a ride to, whose property we transport without first checking that property, and what we bring into an airport. Only a few days ago, Transportation Security Administration (TSA) personnel at New York’s John F. Kennedy Airport arrested New York criminal lawyer Joseph Tacopina for allegedly trying to bring brass knuckles in his carry-on bag for an overseas flight. 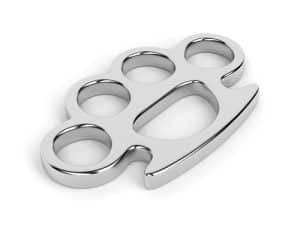 Tacopina’s public defense sounds akin to what prior clients have said when caught with alleged contraband, which here was that he did not know the alleged brass knuckles was put in his bag, and it is a paperweight rather than brass knuckles. Assuming that Tacopina’s explanation is accurate, that means that anyone can make such oversights, but that nobody should, particularly in this post-September 11 world that has all the higher security vigilance at airports. Careful checking is needed in the process of minimizing the risks of a contraband prosecution, including never rushing to the airport, in order to leave enough time to examine baggage for weapons and other contraband; and never driving someone else’s car nor a jointly used automobile without first carefully checking the contents of that vehicle. Virginia weapons lawyer Jonathan L. Katz believes strongly in robust protection for weapons possession and use under the Second Amendment and beyond, and pursues your best defense against felony, misdemeanor and DUI/DWI prosecutions. To discuss your case with Jon Katz, please schedule a confidential consultation through his staff, at 703-383-1100.